The woman who pepper-sprayed 20 people at a Los Angeles Wal-Mart may not face criminal charges because the police say she might have fired in self defense. There are few things that leave my faith in humanity ruptured and bleeding on the floor as immediately and effectively as Black Friday. I didn't hear any reports of anyone being killed in this year's quest for an extra ten percent off the already low, low price on cheaply-made consumer goods that nobody really needs anyway, but that doesn't mean that there wasn't plenty of appallingly bad behavior on display. The 2011 poster child for "What is Wrong With You People?" has to be the woman who fired pepper spray in a crowded Wal-Mart in Los Angeles. An estimated 20 people were affected by the attack, although fortunately nobody was seriously injured; she fired the pepper spray multiple times "to gain preferred access to a variety of locations in the store," according to Los Angeles Fire Department Captain James Carson, who added, "She was competitive shopping." But now the police say that initial reports of the woman using the weapon to punch holes through the crowd in order to get the best deals may have been incorrect, and that she may not be charged with any criminal offenses because it's possible that used the spray in order to avoid being killed. "What am I going to charge her with?" said LAPD Detective Michael Fesperman. 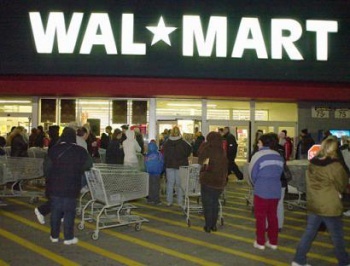 "There was a stampede at Wal-Mart from people getting Xbox games for half off. There was no control. People were getting stampeded and trampled. There were people screaming, yelling that they were being trampled or crushed. This woman may have fired her pepper spray in self-defense." It's still appalling, in other words, but possibly for different reasons than were first thought. Police spent the weekend reviewing YouTube videos and security footage taken from the store and are in the process of conducting interviews with witnesses and victims; a formal decision about whether or not charges will be filed is expected by Wednesday.